Download "Levy Consultation 2010/11. Accident Compensation Corporation. Work Levy Rates for Employers and Self-Employed People"
2 Page 1 ACC Levy Proposals for 2010/11 This document sets out the changes that ACC proposes making to 2010/11 work levy rates for employers and self-employed. As with the levies that fund ACC s other Accounts, we propose increasing work levy rates in 2010/11. ACC proposes to increase the 2010/11 combined work levy rate from $1.31 to $1.89 for every $100 of liable earnings. Why are we proposing to increase levies? The need to increase levies has been driven by many factors. These include: the cost of providing ACC s services is continuing to rise. The number of claims we receive annually is increasing (especially serious injury claims, which tend to be more expensive and more ongoing) and the cost of medical treatment has continued to increase. our more realistic approach to estimating future costs and liability which has shown that there is now a significant gap between ACC s liabilities and its assets. That deficit is now over $10 billion. ACC s rehabilitation performance has fallen for a number of reasons. For example, many people these days have more complex rehabilitation needs, partly because of New Zealand s ageing population, but also because of the increase of co-morbidities such as diabetes, obesity and osteoarthritis. Compounding factors As well as the major drivers outlined above, there are various other factors that are contributing to the upward pressure on levies. These include: recent extensions to the Scheme these have been driven by legislative change and mean we now cover more types of injury than ever before the global recession this has reduced ACC s investments (which we use to help fund our services) and also made it more difficult to return injured people to work. The extent of the current pressures on the ACC Scheme means that in the short-term levy rises are inevitable. Steps we re taking to address cost pressures We appreciate that the cost pressures on the ACC Scheme have reached a point where, if left unchecked, they would result in unacceptably high ACC levies for New Zealanders. Therefore, both the Minister for ACC and ACC itself are addressing the drivers of cost increases (and the associated upward trend of levies). For example, the Minister: is considering legislation to repeal a number of recent Scheme extensions has announced a Stocktake to identify how the Scheme can be improved to deliver better value for money. 3 Page 2 At the same time, within ACC we: have launched a new claims triage system, designed to help us assess and address the specific rehabilitation needs of clients more promptly and accurately. A key benefit of this being that we ll be able to better target the assistance provided to those with more complex needs, to ensure their rehabilitation doesn t become unnecessarily protracted have developed programmes to reduce unnecessary time off work after injury have adopted a new approach to managing longer-term claims are introducing a new model for purchasing services from treatment providers, aimed at achieving better value for money and improved rehabilitation outcomes. The initiatives planned to offset these cost pressures will, once they ve taken effect, help to contain future levy rises. Increasing the work levy rate ACC is proposing to increase the combined work levy rate to cover the costs of 2010/11 work claims and an additional funding adjustment over the next five years to address the under-funding of existing claims. The increased funding requirement for the work levy has been caused by: the current 2009/10 levy rate being set below actual claim costs (i.e. reserves are being used to fund a portion of the current costs) lower than expected investment income due to the current global recession increasing cost estimates for the ongoing liability of existing claims (i.e. increased claims liability provisioning). Claims liability estimate increases have predominantly been in the following areas: weekly compensation costs claim numbers have increased and people are remaining on the Scheme for longer periods elective surgery the costs of surgery and related consumables (particularly implants) are increasing at rates much higher than inflation medical treatment increasing costs are being driven by high medical-related inflation, increased uptake of services, increased contribution towards treatment and a changing mix of treatment being provided. 4 Page 3 The graph below shows the historical combined levy rates and the proposed combined levy rate for 2010/11 for the Work Account and the Residual Claims Account and future projections to 2019/20. Total Work levy rate per $100 earnings Rate per $100 Liable Earning $2.20 $2.00 $1.80 $1.60 $1.40 $1.20 $1.00 $0.80 $0.60 $0.40 $0.20 $0.00 $1.89 $1.91 $1.94 $1.96 $1.89 $1.36 $1.32 $1.31 $1.26 $1.22 $1.23 $1.26 $1.28 $ / / / / / / / / / / / / / /20 Levy year beginning 1 April Pre-1999 claim levy Post-1999 The following graph illustrates the current funding position and the period over which the full funding target will be achieved for both the Work Account and Residual Claims Account. Funding of Work Account and Residual Claims Account Liabilities Percent Funded 200% 180% 160% 140% 120% 100% 80% 60% 40% 20% 0% Actual Projected Funding for new claims Pre-1999 claim levy Funding target Position as at Year Ending 30 June The above graph shows that at 31 March 2007 the Work Account held assets equal to 186% of the outstanding claims liability, well in excess of the full funding target. Levy rates for recent years were therefore set below actual claim costs in order to return these excess reserves to levy payers. In addition reserves were further run-down due to increasing claim costs and the lower investment returns received during the current recession. 5 Page 4 The Work Account currently holds assets equivalent to 99% of the claim liability for claims that occurred after 30 June The funding position is projected to reduce to 90% of claim liabilities as at 1 April 2010 (i.e. the beginning of the new 2010/11 levy year) as the current 2009/10 levy rate is not sufficient to cover claim costs. 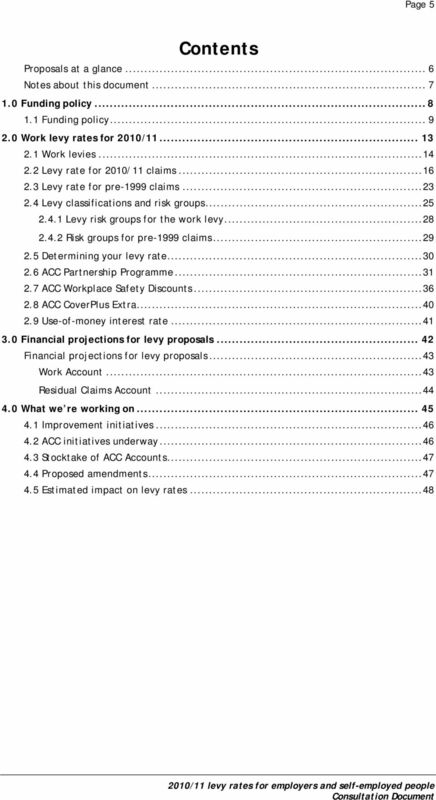 ACC proposes to increase the 2010/11 levy for the Work Account to cover costs and restore reserves over the next four years. 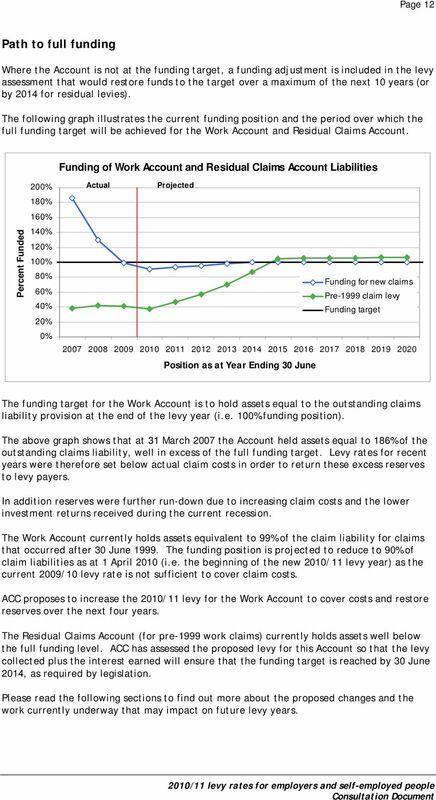 The Residual Claims Account (for pre-1999 work claims) currently holds assets well below the full funding level. ACC has assessed the proposed levy for this Account so that the levy collected plus the interest earned will ensure that the funding target is reached by 30 June 2014, as required by legislation. Please read the following sections to find out more about the proposed changes and the work currently underway that may impact on future levy years. 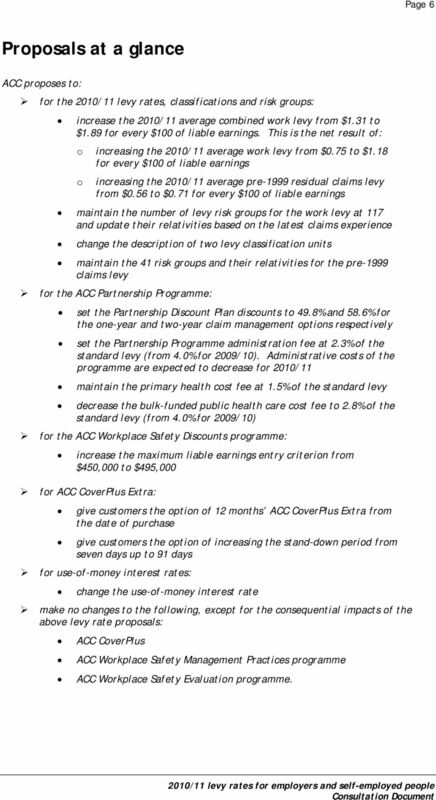 7 Page 6 Proposals at a glance ACC proposes to: for the 2010/11 levy rates, classifications and risk groups: increase the 2010/11 average combined work levy from $1.31 to $1.89 for every $100 of liable earnings. This is the net result of: o increasing the 2010/11 average work levy from $0.75 to $1.18 for every $100 of liable earnings o increasing the 2010/11 average pre-1999 residual claims levy from $0.56 to $0.71 for every $100 of liable earnings maintain the number of levy risk groups for the work levy at 117 and update their relativities based on the latest claims experience change the description of two levy classification units maintain the 41 risk groups and their relativities for the pre-1999 claims levy for the ACC Partnership Programme: set the Partnership Discount Plan discounts to 49.8% and 58.6% for the one-year and two-year claim management options respectively set the Partnership Programme administration fee at 2.3% of the standard levy (from 4.0% for 2009/10). Administrative costs of the programme are expected to decrease for 2010/11 maintain the primary health cost fee at 1.5% of the standard levy decrease the bulk-funded public health care cost fee to 2.8% of the standard levy (from 4.0% for 2009/10) for the ACC Workplace Safety Discounts programme: increase the maximum liable earnings entry criterion from $450,000 to $495,000 for ACC CoverPlus Extra: give customers the option of 12 months ACC CoverPlus Extra from the date of purchase give customers the option of increasing the stand-down period from seven days up to 91 days for use-of-money interest rates: change the use-of-money interest rate make no changes to the following, except for the consequential impacts of the above levy rate proposals: ACC CoverPlus ACC Workplace Safety Management Practices programme ACC Workplace Safety Evaluation programme. 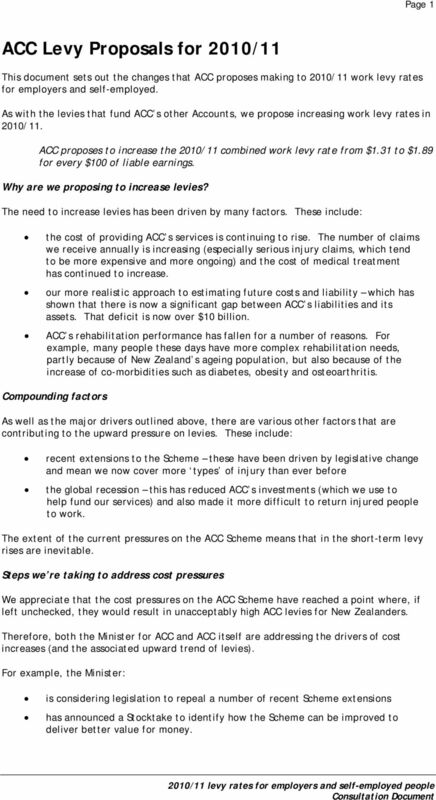 8 Page 7 Notes about this document This consultation document should be read in conjunction with the document ACC Personal Injury Insurance for all New Zealanders, which provides further background on the ACC Scheme and the source and application of levy income. Supplementary information is also available from including actuarial reports relating to setting levy rates and the estimated outstanding claims liability. You should note the following caveats when reading this document: All rates in this document are expressed as GST exclusive unless specifically noted. For presentation purposes, some numbers in this document have been rounded. This means that you may not be able to replicate ACC s calculations by using these numbers. All levy rates in this document are preliminary estimates. They may be adjusted before the final recommendations are made to the Government to reflect, for example, any changes in the valuation of claim liabilities and the latest long-term interest rates. These factors may impact on the final levy rates. Claim number and cost assumptions are continually updated and are likely to change each year. In determining levy assessments, ACC must estimate the number of claims likely to occur and the estimated costs of these claims (some claims will have costs extending for years into the future). Estimating claim costs years into the future has a considerable degree of uncertainty associated with it (e.g. future medical and rehabilitation cost increases and investment returns) and therefore these assumptions are likely to change each year. 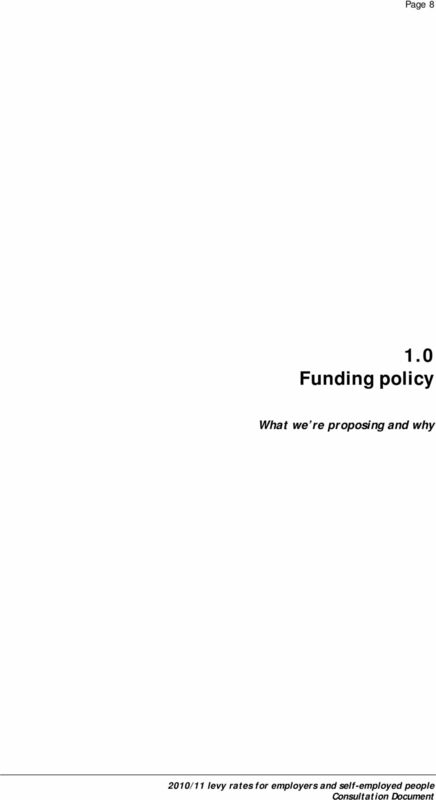 10 Page Funding policy Current claims (i.e. post-1999 claims) We are required to ensure that all levied ACC Accounts have enough funds to provide for future costs (i.e. are fully funded), even when we don t know precisely what those costs will be. We also have to ensure that the levies we charge to cover these costs are fair and stable. Managing these two requirements is the focus of our funding policy, which aims to: manage levy stability over time ensure each ACC Account has enough funds. The two key elements that make up our funding policy are: our funding target this is based on the total value of the ongoing future costs of new and existing claims. The target must ensure that enough funds are accumulated to be quite sure that these funds adequately cover future costs timeframe the time over which we will restore funds to the funding target if the target is not being achieved. The funding target is affected by the economic assumptions we use in our estimates of future claim costs (e.g. the rate of return on our investments and inflation rates on medical costs) and the margins we allow for forecasting uncertainty. 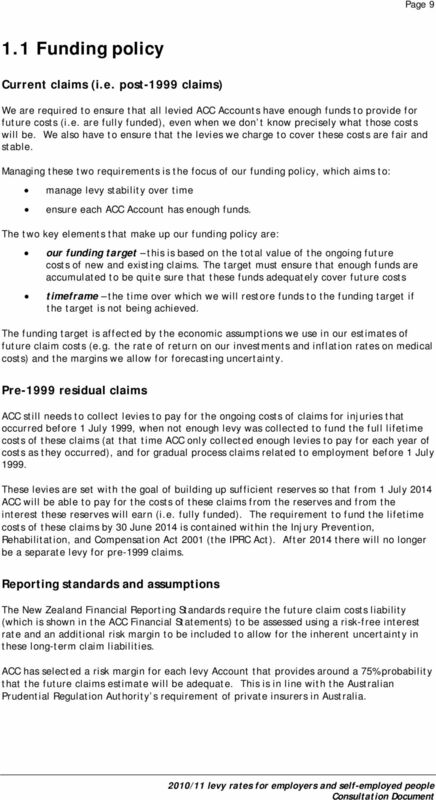 Pre-1999 residual claims ACC still needs to collect levies to pay for the ongoing costs of claims for injuries that occurred before 1 July 1999, when not enough levy was collected to fund the full lifetime costs of these claims (at that time ACC only collected enough levies to pay for each year of costs as they occurred), and for gradual process claims related to employment before 1 July These levies are set with the goal of building up sufficient reserves so that from 1 July 2014 ACC will be able to pay for the costs of these claims from the reserves and from the interest these reserves will earn (i.e. fully funded). The requirement to fund the lifetime costs of these claims by 30 June 2014 is contained within the Injury Prevention, Rehabilitation, and Compensation Act 2001 (the IPRC Act). After 2014 there will no longer be a separate levy for pre-1999 claims. Reporting standards and assumptions The New Zealand Financial Reporting Standards require the future claim costs liability (which is shown in the ACC Financial Statements) to be assessed using a risk-free interest rate and an additional risk margin to be included to allow for the inherent uncertainty in these long-term claim liabilities. ACC has selected a risk margin for each levy Account that provides around a 75% probability that the future claims estimate will be adequate. This is in line with the Australian Prudential Regulation Authority s requirement of private insurers in Australia. 11 Page 10 Legislative funding requirements Section 169 of the IPRC Act requires that the Work Account levy rates be calculated so that the costs of all claims are fully funded. Section 193 requires that the cost of residual claims be fully funded by the year Funding policy adopted for 2010/11 We have adopted the following funding policy in assessing the 2010/11 levy proposals. In addition to applying this funding policy, ACC may consider and apply other factors in determining the final total levy proposal. Current levies (i.e. funding for post 1 July 1999 claims) (a) The funding target is to maintain assets equal to the outstanding claims provision at the end of each financial year. (b) The outstanding claims provision is to include a risk margin that provides a 75% probability that the outstanding claims provision is adequate to cover future claim payments. (c) The outstanding claims provision is to be based on a long term, risk-free interest rate of 6%, based on long-term historical trends. The interest rate for the first three years is based on the most recent yield curve indicated from the trading market of the New Zealand government bond. (d) The total levy requirement is to be assessed each year as: (i) the expected fully funded cost of claims and expenses for injuries that are expected to be incurred during the upcoming levy year plus or minus (ii) a funding adjustment aimed at achieving the funding target over a maximum period of the next 10 levy years. The timeframe selected will have particular regard to intergenerational equity and affordability (iii) plus or minus a smoothing adjustment to provide additional levy stability or smoothing of changes over time. (e) Where assets are expected to be lower than the funding target at the beginning of the levy year, funding and smoothing adjustments will not be applied if they would result in the total levy being lower than that required to fully fund the cost of claims and expenses for injuries that are expected to be incurred during the upcoming levy year. (f) Levy structures and rates for classes of levy payers must be consistent with achieving the total levy requirement. Residual levies (i.e. 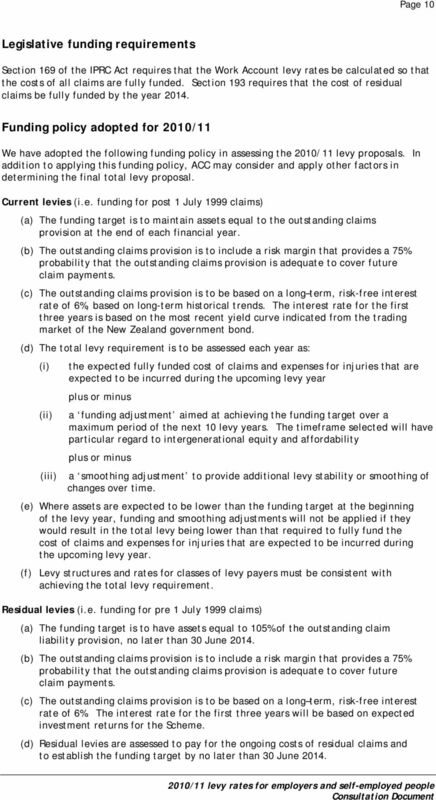 funding for pre 1 July 1999 claims) (a) The funding target is to have assets equal to 105% of the outstanding claim liability provision, no later than 30 June (b) The outstanding claims provision is to include a risk margin that provides a 75% probability that the outstanding claims provision is adequate to cover future claim payments. (c) The outstanding claims provision is to be based on a long term, risk-free interest rate of 6%. The interest rate for the first three years will be based on expected investment returns for the Scheme. (d) Residual levies are assessed to pay for the ongoing costs of residual claims and to establish the funding target by no later than 30 June 2014. 12 Page 11 (e) Levy structures and rates for classes of levy payers must be consistent with achieving the total levy requirement. Risk-free interest rate The risk-free interest rate is the interest rate that it is assumed can be obtained by investing in financial instruments with no default risk. Although a truly risk-free asset exists only in theory, in practice most organisations use Government bond rates as the base. These securities are considered to be risk-free because the likelihood of governments defaulting is extremely low. Since this interest rate can be obtained with no risk, it is implied that any additional risk taken by an investor should be rewarded with an interest rate higher than the risk-free rate. 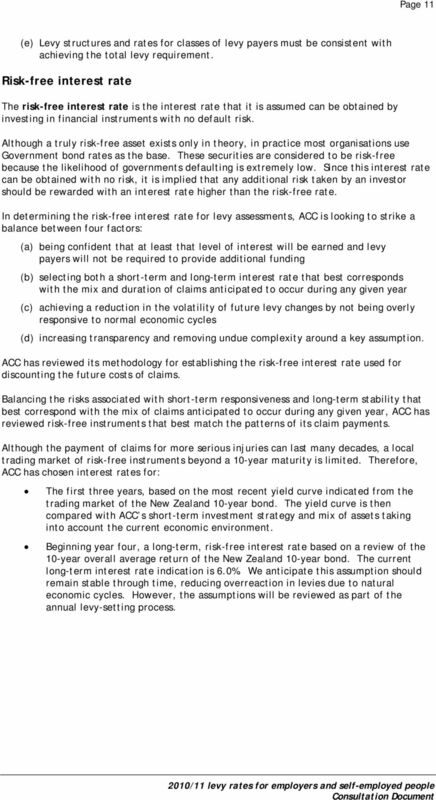 In determining the risk-free interest rate for levy assessments, ACC is looking to strike a balance between four factors: (a) being confident that at least that level of interest will be earned and levy payers will not be required to provide additional funding (b) selecting both a short-term and long-term interest rate that best corresponds with the mix and duration of claims anticipated to occur during any given year (c) achieving a reduction in the volatility of future levy changes by not being overly responsive to normal economic cycles (d) increasing transparency and removing undue complexity around a key assumption. ACC has reviewed its methodology for establishing the risk-free interest rate used for discounting the future costs of claims. Balancing the risks associated with short-term responsiveness and long-term stability that best correspond with the mix of claims anticipated to occur during any given year, ACC has reviewed risk-free instruments that best match the patterns of its claim payments. Although the payment of claims for more serious injuries can last many decades, a local trading market of risk-free instruments beyond a 10-year maturity is limited. Therefore, ACC has chosen interest rates for: The first three years, based on the most recent yield curve indicated from the trading market of the New Zealand 10-year bond. The yield curve is then compared with ACC s short-term investment strategy and mix of assets taking into account the current economic environment. Beginning year four, a long-term, risk-free interest rate based on a review of the 10-year overall average return of the New Zealand 10-year bond. The current long-term interest rate indication is 6.0%. We anticipate this assumption should remain stable through time, reducing overreaction in levies due to natural economic cycles. However, the assumptions will be reviewed as part of the annual levy-setting process. 13 Page 12 Path to full funding Where the Account is not at the funding target, a funding adjustment is included in the levy assessment that would restore funds to the target over a maximum of the next 10 years (or by 2014 for residual levies). The following graph illustrates the current funding position and the period over which the full funding target will be achieved for the Work Account and Residual Claims Account. Funding of Work Account and Residual Claims Account Liabilities Percent Funded 200% 180% 160% 140% 120% 100% 80% 60% 40% 20% 0% Actual Projected Funding for new claims Pre-1999 claim levy Funding target Position as at Year Ending 30 June The funding target for the Work Account is to hold assets equal to the outstanding claims liability provision at the end of the levy year (i.e. 100% funding position). The above graph shows that at 31 March 2007 the Account held assets equal to 186% of the outstanding claims liability, well in excess of the full funding target. Levy rates for recent years were therefore set below actual claim costs in order to return these excess reserves to levy payers. In addition reserves were further run-down due to increasing claim costs and the lower investment returns received during the current recession. The Work Account currently holds assets equivalent to 99% of the claim liability for claims that occurred after 30 June The funding position is projected to reduce to 90% of claim liabilities as at 1 April 2010 (i.e. the beginning of the new 2010/11 levy year) as the current 2009/10 levy rate is not sufficient to cover claim costs. ACC proposes to increase the 2010/11 levy for the Work Account to cover costs and restore reserves over the next four years. 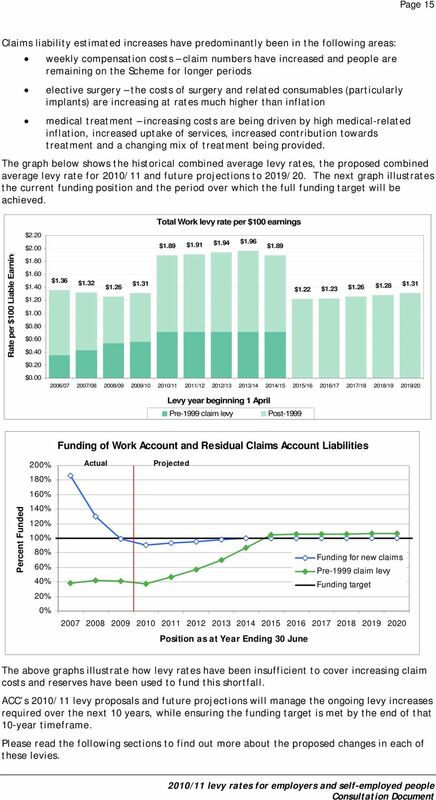 The Residual Claims Account (for pre-1999 work claims) currently holds assets well below the full funding level. ACC has assessed the proposed levy for this Account so that the levy collected plus the interest earned will ensure that the funding target is reached by 30 June 2014, as required by legislation. Please read the following sections to find out more about the proposed changes and the work currently underway that may impact on future levy years. 15 Page Work levies In this section you ll find the proposed 2010/11 ACC levy rates for employers and selfemployed people, and how they have been calculated. If you are an employer, your annual work levies fund ACC cover for your employees workrelated personal injuries. You pay these through ACC WorkPlace Cover. If you are self-employed, your annual work levies fund ACC cover for your work-related personal injuries. You pay these through ACC CoverPlus or ACC CoverPlus Extra. For information about how non-work personal injuries are funded, please read ACC Personal Injury Insurance for all New Zealanders and the consultation documents for the Earners Account and Motor Vehicle Account. 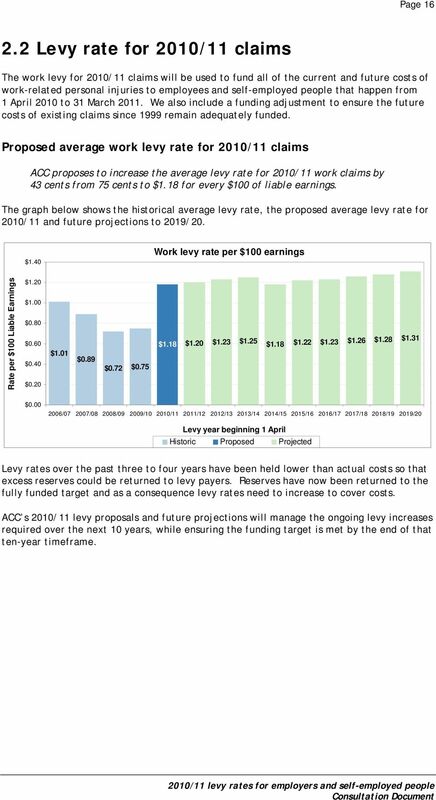 Proposed combined average work levy rate ACC proposes to increase the 2010/11 combined average work levy rate from $1.31 to $1.89 for every $100 of liable earnings. The combined average work levy consists of two components: a levy for 2010/11 work claims that funds the costs of work-related injuries that occur during the levy year a levy for pre-1999 work claims, which pays for the ongoing costs of claims for work-related injuries that occurred before 1 July 1999, and establishes funding to meet future liabilities by 30 June Here s how the proposed average rates compare with the current rates: Current 2009/10 rates Proposed 2010/11 rates Average levy for current year work claims $0.75 $1.18 Average levy for pre-1999 work claims $0.56 $0.71 Combined average work levy rate (per $100 liable earnings) $1.31 $1.89 Why is there an increase? The 2010/11 levy assessment is not done in isolation; ACC also needs to look at future funding requirements, ongoing levy stability and expected fund levels. The overall aim is to ensure the ACC Scheme continues to be funded adequately and manage levy stability and smoothing over time. 2010/11 levy increases are mostly being driven by the need to maintain the funding required for existing claims. Levy increases are required to fund increases both in the expected future costs of existing claims (i.e. claims liability provision) and in the expected costs of claims that happen during the new levy year. This increased funding requirement has been caused by: the current 2009/10 levy rate being set below actual claim costs (i.e. reserves are being used to fund a portion of the current claim costs) lower than expected investment income due to the current global recession increasing cost estimates for the ongoing liability of existing claims (i.e. increased claims liability provisioning). 16 Page 15 Claims liability estimated increases have predominantly been in the following areas: weekly compensation costs claim numbers have increased and people are remaining on the Scheme for longer periods elective surgery the costs of surgery and related consumables (particularly implants) are increasing at rates much higher than inflation medical treatment increasing costs are being driven by high medical-related inflation, increased uptake of services, increased contribution towards treatment and a changing mix of treatment being provided. The graph below shows the historical combined average levy rates, the proposed combined average levy rate for 2010/11 and future projections to 2019/20. The next graph illustrates the current funding position and the period over which the full funding target will be achieved. Rate per $100 Liable Earning $2.20 $2.00 $1.80 $1.60 $1.40 $1.20 $1.00 $0.80 $0.60 $0.40 $0.20 $0.00 Total Work levy rate per $100 earnings $1.89 $1.91 $1.94 $1.96 $1.89 $1.36 $1.32 $1.31 $1.26 $1.22 $1.23 $1.26 $1.28 $ / / / / / / / / / / / / / /20 Levy year beginning 1 April Pre-1999 claim levy Post-1999 Funding of Work Account and Residual Claims Account Liabilities Percent Funded 200% 180% 160% 140% 120% 100% 80% 60% 40% 20% 0% Actual Projected Funding for new claims Pre-1999 claim levy Funding target Position as at Year Ending 30 June The above graphs illustrate how levy rates have been insufficient to cover increasing claim costs and reserves have been used to fund this shortfall. ACC s 2010/11 levy proposals and future projections will manage the ongoing levy increases required over the next 10 years, while ensuring the funding target is met by the end of that 10-year timeframe. Please read the following sections to find out more about the proposed changes in each of these levies. 17 Page Levy rate for 2010/11 claims The work levy for 2010/11 claims will be used to fund all of the current and future costs of work-related personal injuries to employees and self-employed people that happen from 1 April 2010 to 31 March We also include a funding adjustment to ensure the future costs of existing claims since 1999 remain adequately funded. Proposed average work levy rate for 2010/11 claims ACC proposes to increase the average levy rate for 2010/11 work claims by 43 cents from 75 cents to $1.18 for every $100 of liable earnings. The graph below shows the historical average levy rate, the proposed average levy rate for 2010/11 and future projections to 2019/20. $1.40 Work levy rate per $100 earnings Rate per $100 Liable Earnings $1.20 $1.00 $0.80 $0.60 $0.40 $0.20 $1.01 $0.89 $0.72 $0.75 $1.18 $1.20 $1.23 $1.25 $1.18 $1.22 $1.23 $1.26 $1.28 $1.31 $ / / / / / / / / / / / / / /20 Levy year beginning 1 April Historic Proposed Projected Levy rates over the past three to four years have been held lower than actual costs so that excess reserves could be returned to levy payers. Reserves have now been returned to the fully funded target and as a consequence levy rates need to increase to cover costs. ACC s 2010/11 levy proposals and future projections will manage the ongoing levy increases required over the next 10 years, while ensuring the funding target is met by the end of that ten-year timeframe. 18 Page 17 What s behind the changes This table shows at a glance what s behind the proposed average work levy rate for 2010/11 claims. Current 2009/10 Proposed 2010/11 To fund the cost of new claims during levy year $0.84 $0.87 To fund Scheme costs $0.18 $0.19 Funding adjustment -$0.31 $0.08 Workplace Safety Management Practices discount funding $0.04 $0.04 Work levy rate for claims per $100 of liable earnings $0.75 $1.18 The proposed increase in the average work levy rate for 2010/11 claims are driven by changes in the: cost and frequency of claims costs of running the ACC Scheme level of funds we expect to have. The following table shows the major changes for 2010/11 and their impacts on levy rates. Impact on levy rate for every $100 of liable earnings Average work levy rate for 2009/10 claims $ 0.75 Change in: Cost of claims increased weekly compensation costs, medical and elective surgery and rehabilitation costs are impacting the work levy Scheme costs the overall Scheme costs have remained at the same levels Funding adjustment previous years levy rates were not sufficient to cover costs, which have resulted in reserves being run down below the fully funded target. The aim is to not allow the levy to go below that required to fund the estimated costs of the new levy year, while restoring reserves over the next ten years +$ $ $ 0.39 Proposed average work levy rate for 2010/11 claims $ 1.18 Please read on to find out more about the proposed changes to the average work levy rate for 2010/11 claims. 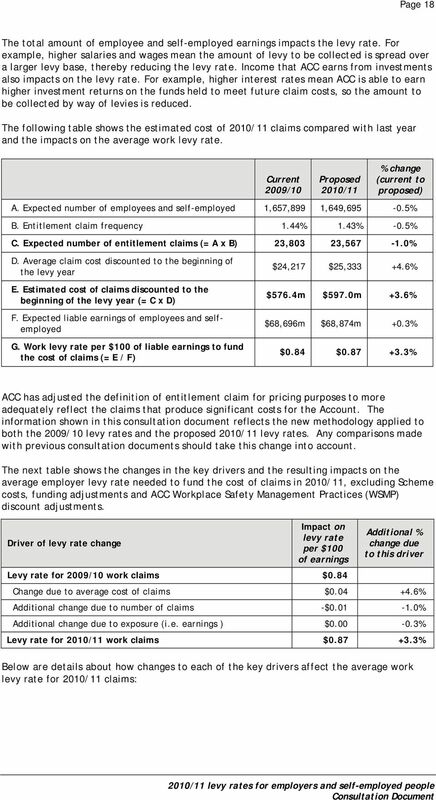 (a) Cost of claims Impact: Increases the average work levy rate for 2010/11 claims by 3 cents. The key drivers behind the estimated cost of new claims are the average cost of claims and the number of claims, especially entitlement claims. An entitlement claim includes one that incurs costs for income replacement (weekly compensation) or rehabilitation after the initial medical treatment. 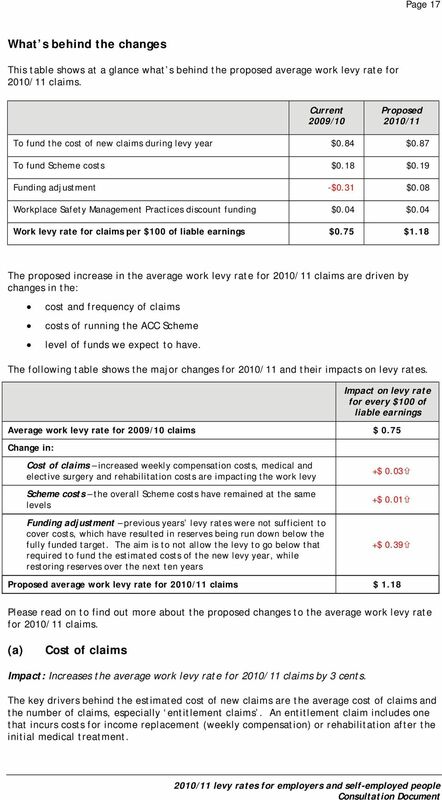 20 Page 19 (i) Change in average cost of claims Impact: Increases the average work levy rate for 2010/11 claims by 4 cents. The estimated average cost of claims is influenced by changes in the volume and cost of services provided to clients. Forecast for 2010/11: The main reasons for the change in the average cost of an entitlement claim for 2010/11 have been the increased expected costs of weekly compensation, elective surgery, and medical treatment. The following table shows the estimated average entitlement claim cost by type of entitlement. 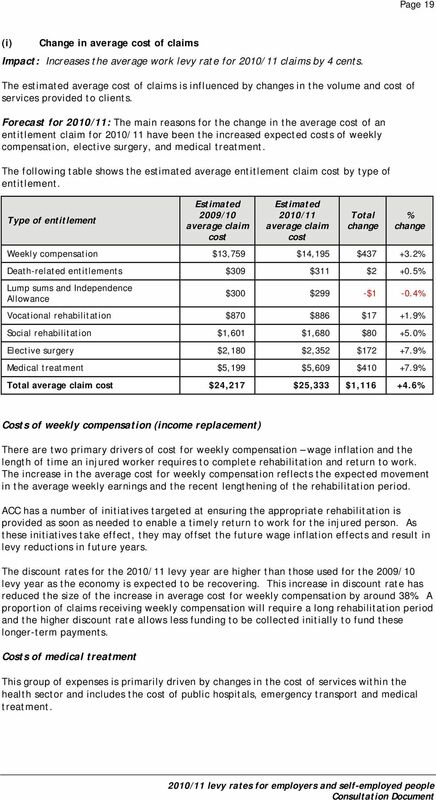 Type of entitlement Estimated 2009/10 average claim cost Estimated 2010/11 average claim cost Total change % change Weekly compensation $13,759 $14,195 $ % Death-related entitlements $309 $311 $2 +0.5% Lump sums and Independence Allowance $300 $299 -$1-0.4% Vocational rehabilitation $870 $886 $ % Social rehabilitation $1,601 $1,680 $ % Elective surgery $2,180 $2,352 $ % Medical treatment $5,199 $5,609 $ % Total average claim cost $24,217 $25,333 $1, % Costs of weekly compensation (income replacement) There are two primary drivers of cost for weekly compensation wage inflation and the length of time an injured worker requires to complete rehabilitation and return to work. The increase in the average cost for weekly compensation reflects the expected movement in the average weekly earnings and the recent lengthening of the rehabilitation period. ACC has a number of initiatives targeted at ensuring the appropriate rehabilitation is provided as soon as needed to enable a timely return to work for the injured person. As these initiatives take effect, they may offset the future wage inflation effects and result in levy reductions in future years. The discount rates for the 2010/11 levy year are higher than those used for the 2009/10 levy year as the economy is expected to be recovering. This increase in discount rate has reduced the size of the increase in average cost for weekly compensation by around 38%. A proportion of claims receiving weekly compensation will require a long rehabilitation period and the higher discount rate allows less funding to be collected initially to fund these longer-term payments. Costs of medical treatment This group of expenses is primarily driven by changes in the cost of services within the health sector and includes the cost of public hospitals, emergency transport and medical treatment. 21 Page 20 The increasing costs of medical treatment have been driven by factors that include: wage inflation in the health sector, which is significantly higher than in other sectors of the community an increased uptake of specialist services and use of physiotherapy not requiring client co-payments an increasing use of high-tech radiology (mainly MRI) by medical professionals increases in the costs of services provided by accident and medical clinics. As most medical treatment costs occur early in the life of an injury, the increase in discount rates from 2009/10 to 2010/11 has not significantly reduced the impact on the levy of the rising medical costs and increased use of high-cost services. Costs of elective surgery ACC undertakes a significant amount of elective surgery each year. In 2008/09 ACC paid around $37 million for elective surgery performed on injured workers (ACC paid a total of $240 million for elective surgery in 2008/09). The cost of providing elective surgery is high because of the costs associated with setup and maintenance of facilities, the limited supply of surgeons, and the general high rate of inflation for both wages and consumables/implants associated with surgery. 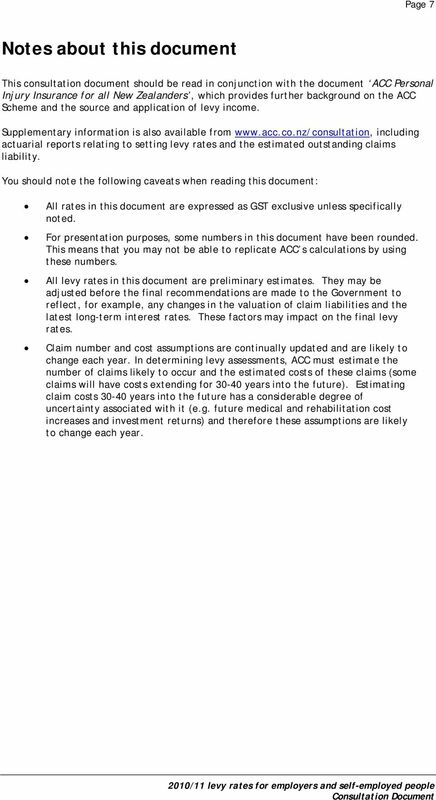 ACC expects that the high level of price increase and the increasing use of elective surgery will continue for 2010/11. 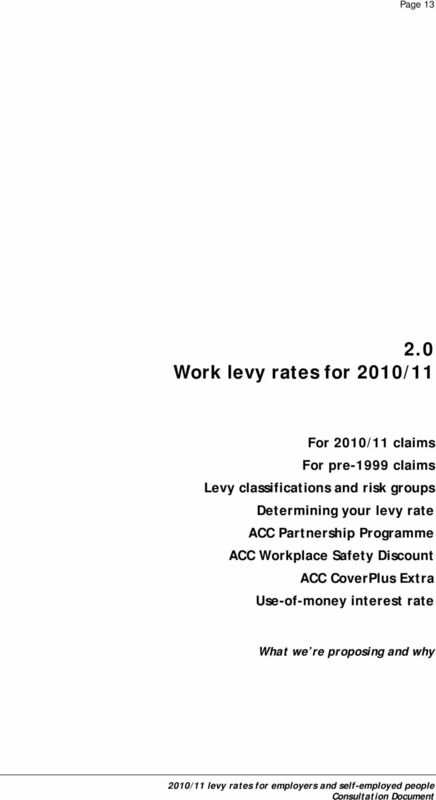 (ii) Change in number of claims Impact: Decreases the average work levy rate for 2010/11 claims by 1 cent. Changes in the number of claims made can affect the average levy rate. The types of claim that have the most impact on levy rates are entitlement claims ones that incur costs beyond the initial medical treatment. These costs include hospital treatment (such as surgery) and weekly compensation for time off work. The more entitlement claims that are made, the more chance there is an increase in the levy rates and vice versa. Forecast for 2010/11: In recent years the number of work-related entitlement claims has been decreasing, while the number of entitlement claims in the Earners Account has been increasing. For the upcoming levy year, the inversely related trends in both Accounts are expected to subside and stabilise. The number of work-related entitlement claims is estimated to be 1% lower than that of 2009/10. (iii) Change in employee and self-employed earnings Impact: No change to the average work levy rate for 2010/11 claims. ACC uses actual earnings to assess liability for personal injury cover. For employers, this is the total liable earnings for the tax year. For self-employed people, this is their individual liable earnings during the previous tax year. Changes in the total liable earnings can affect the levy rate, even if everything stays the same. For example, if total claim costs are stable but the earnings base is shrinking, the levy rate will have to increase each year to collect the same amount of money to cover claim costs. The reverse is also true. 22 Page 21 Forecast for 2010/11: The combined earnings for employees and self-employed people for 2010/11 are expected to increase to $68,874 million. This is 0.3% more than the earnings that were used to assess the 2009/10 levies. (b) Scheme costs Impact: Increases the average work levy rate for 2010/11 claims by 1 cent. This is how much it costs each year to run the ACC Scheme, including injury prevention, levy collection and operating costs. The following table shows the 2010/11 estimated Scheme costs for the Work Account. Scheme Costs Current Proposed Levy collection costs $13.1m $13.0m Injury Prevention costs $17.0m $16.8m Operating costs $93.3m $100.3m H. Estimated Scheme costs $123.4m $130.1m I. Expected employee and self-employed earnings $68,696m $68,874m J. Average claims levy rate to fund Scheme costs (= H / I) $0.18 $0.19 Increased operating costs for 2010/11 are due to an increased provision in the estimated claims liability for future management of existing claims and an increased provision for bad debts. This is being offset by the increase in estimated liable earnings. 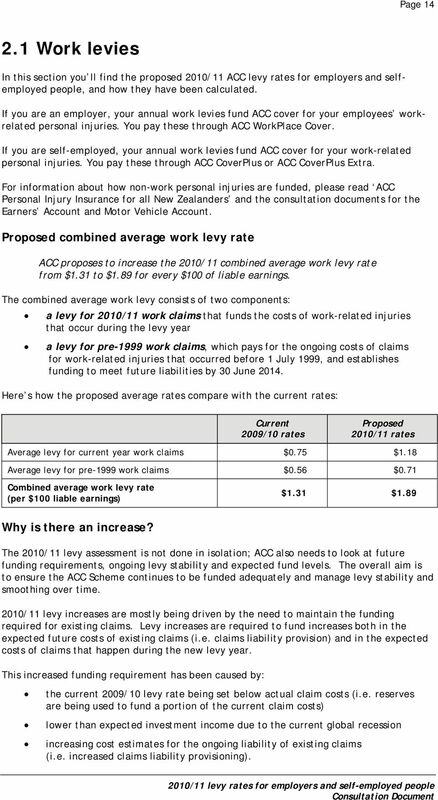 (c) Funding adjustment Impact: Increase the average work levy rate for 2010/11 claims by 39 cents. The ACC Scheme is required to be fully funded. The ACC full funding policy is to hold assets equal to 100% of the estimated ongoing future costs of claims inclusive of risk margin. Where actual funds are higher or lower than the funding target of 100% of estimated future claim costs, a funding adjustment is included in the levy assessment to restore funds to that target over a maximum of the next 10 years. Funds held in reserve can be used to smooth ongoing changes to levy rates. Forecast for 2010/11: the change in the funding adjustment is the single largest contributor to the proposed increase in the average 2010/11 levy rate. The funding adjustment applied in previous years effectively provided a rebate that returned excess reserves to levy payers via lower levy rates. Funding levels are now slightly below the fully funded target of 100% of the estimated future claims costs, while assets are currently equivalent to 99% of the claim liability for claims for injuries after 30 June This is projected to reduce further to 90% of claims liabilities as at 1 April 2010 (i.e. the start of the new 2010/11 levy year). This means additional funding is now required to restore these reserves to the funding target and the previous rebate is removed. The proposed levy rates will now cover claim costs and see reserves being restored over the following four years. 23 Page 22 Reserves have been run down faster than expected over the past two years. In addition to setting the current 2009/10 levy rate below actual claim costs (i.e. using reserves to fund a portion of the current claim costs), increased funding requirements have been caused by: lower than expected investment income due to the current global recession increasing cost estimates for the ongoing liability of existing claims (i.e. increased claims liability provisioning). Claims liability estimate increases have predominantly been in the following areas: weekly compensation costs claim numbers have increased and people are remaining on the Scheme for longer periods elective surgery the costs of surgery and related consumables (particularly implants) are increasing much higher than inflation medical treatment increasing costs are being driven by high medical-related inflation, increased uptake of services, increased contribution towards treatment and a changing mix of treatment being provided. 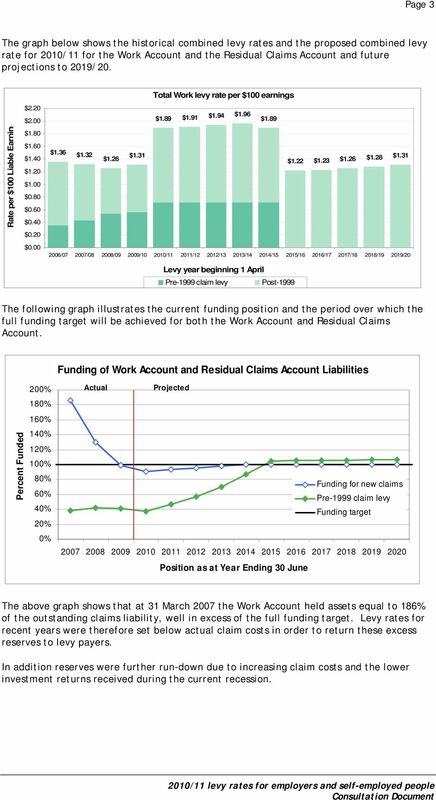 The following graph shows the expected funding levels as at 30 June 2009 and the projected path to full funding through to 31 March Work Account - funding for post-1999 work claims 200% Percent Funded 180% 160% 140% 120% 100% 80% 60% 40% 20% 0% Actual Projected Funding Target 186% 129% 99% 90% 93% 96% 98% 100% 100% 100% 100% 100% 100% 100% Position as at 31 March (d) ACC Workplace Safety Management Practices discount funding Impact: No change to the average work levy rate for 2010/11 claims. ACC Workplace Safety Management Practices (WSMP) discounts are funded by a loading on the average work levy rate. In 2009/10 this loading was 4 cents per $100 of liable earnings. Forecast for 2010/11: ACC proposes to maintain the WSMP discount proportion of the average work levy rate at 4 cents for every $100 of liable earnings. 26 Page Levy classifications and risk groups In this section you ll find the proposed changes to the risk groups used to set levy rates for 2010/11 and to the classification units that will be used to set 2010/11 levies. Classification and risk group proposals for 2010/11 ACC proposes to: maintain the number of levy risk groups for the work levy at 117 and update their relativities based on the latest claims experience change the description of two levy classification units maintain the 41 risk groups and their relativities for the pre-1999 claims levy. Overview of classifications and risks The purpose of a classification system is to classify employers and self-employed people into groups to facilitate fair and equitable levy rates. A classification system should ensure that the costs of claims are distributed fairly among the industries responsible for those costs. ACC uses an industry-based classification system based on the Australian and New Zealand Standard Industrial Classification 2006 (ANZSIC). Levy payers are classified by the type of industry in which they are engaged (not by the occupations of employees). Employers and self-employed people are allocated to the levy classification unit that most accurately describes their activity, usually determined by the services provided or goods produced. In setting levy rates, individual industrial activities (classifications) are grouped with others of similar activity and injury risk so that the cost of work injuries is fairly distributed among those with common characteristics (i.e. risk groups or insurance pools). Industry levies reflect the weighted average cost of all activities or occupations within each industry. Classification principles and rules ACC has adopted a set of principles and rules to guide equitable levy assessments and make sure we use cost-effective administration of the classification system for both ACC and levy payers. These principles and rules have been developed in conjunction with levy payers and other interested parties. The principles are: Principle (a): Using a classification system to preserve equity between risk groups, encourage injury prevention and reflect the true cost of compensation. Principle (b): Principle (c): Principle (d): Principle (e): Grouping entities with similar business activities and further grouping these according to injury risk levels. Recognising levy payers need for stability and predictability in levy rates. Making groups large enough to allow reasonable statistical credibility and stability in levy rates. Keeping the system flexible enough so that classification units can shift between groups where their relative cost of injury changes. 27 Page 26 Principle (f): Principle (g): Principle (h): Principle (i): Ensuring that definitions of activities included in each classification and group are clear and unambiguous. Using an externally developed and updated coding system as the basis for the classification units. Ensuring there is transparency and fairness in the system for classifying activities and setting levies. Ensuring that the levy classification system is administered in a costeffective manner. The following classification rules have also been adopted to ensure the development of the classification system in a way that complies with the above principles. The rules are: Rule (a): External classification system The ANZSIC system is selected as the most appropriate independently maintained and up-to-date system. However a number of anomalies arise where ANZSIC codes have significantly different risks. Separate classification units have been created to distinguish between these risks, where necessary. Rule (b): Rule (c): Rule (d): Rule (e): Risk group size To ensure that risk groups are not too small to ensure a statistically credible base on which to set levy rates, ACC has estimated that, where possible, each risk group should have on average a payroll of at least $400 million. This minimum amount is indexed every year to reflect average weekly earnings inflation. Levy smoothing To smooth ongoing adjustments to risk-based levy rates, ACC will consider levy-smoothing options for individual classification units each year in addition to or including any average change in the levy rate. Criteria for moving between risk groups It is important to recognise that classification units can move between risk groups. The relative risk of each classification unit will be reviewed each year and allocated to risk groups that best match the expected risk. Levy assessment for new activities Where new activities do not fit into existing levy classifications, the initial levy rate will be set based on all the relevant data available and may include an element of Corporation judgement of the probable injury risk. Supportive data can include other comparable New Zealand injury data and overseas experience. The resulting levy rate will be subject to review on an annual basis and adjusted within the agreed principles and rules, as for the rates for all other classification units. 1 Audit summary 1.1 Introduction 1.1.1 Background The WorkCover scheme encompasses injury prevention and offers rehabilitation and compensation for workers suffering work-related injuries and illnesses. 3. ASSET REVALUATION RESERVE The asset revaluation reserve represents the surplus in fair value of land and buildings after revaluation. Contents. What is an intergenerational report? Progress Towards the 2020 target I ISBN 978-0-478-41778-4 (online) March 2014 Crown Copyright 2014 The material contained in this report is subject to Crown copyright protection unless otherwise indicated. INVESTMENT. Understanding your investment in super doesn t have to be hard. You don t need to be a financial whiz to make it work for you!